Blackbolt is King of the Inhumans and the most powerful member of their race. Blackbolt will be played actor Anson Mount in in the Marvel Imax series Inhumans. Two high ranking members of the genetist panel (high in importance) of Inhumans are having a child. The embroyo is exposed to a small amount of terrigen mist (The chemical that causes the mutation to bring out Inhumans powers) the child at birth shows the extremely dangerous ability of controlling electrons through his voice. The infant though only a newborn and exposed to a small amount of Terrigen is capable of extreme destruction. The Inhumans place young Blackbolt into a sound proof chamber and train him for his entire young life on how to remain completely silent. Blackbolt's training is so rigorous that he can even prevent himself from making noise while sleeping. When the young Blackbolt emerges from the sound proof chamber he is the most powerful and feared member of the Inhumans ever. Blackbolt's brother Maximus tries goad him into speaking and fights him. Blackbolt does not make a sound. Blackbolt then goes on a trek to see the world of Earth outside of Attilan. Eventually, he comes back and is made into the King of the Inhumans. As King Blackbolt has done many major things. He has moved Attilan the Inhuman city first to the Himalayas then to the Blue Side of the Moon. He freed the Alpha Primitive race. Toylab is a member of the Amazon Affiliate Program and is able to bring our fans the best deals on Inhuman Merchandise directly from Amazon. Blackbolt is stronger, faster, and more durable than other Inhumans. Some of this is due to his ability to control electrons which allows him to control a variety of phenomenon. The electron controlling ability is within his speech part of his brain which means any sound he makes with his voice release a vast powerful blast of energy. Blackbolt can use small or large amounts of sound to make him stronger and faster. Using the pitchfork on his forehead he harnesses the energy around him and controls it. Blackbolt's Sonic Scream can reach a level of power where it can destroy an entire planet or wipe away an armada of advanced starships. He can use his sonic abilities to fly very fast through the air over vast distances. Blackbolt also has minor telepathic abilities that allow him to block psychic attacks. It also allows him to communicate his thoughts. This is helpful because he can not speak without unleashing his destructive voice. His telepathic ability is not high but those who are very tuned into to him can understand him. Medusa in particular can understand what he wants. If you have not guessed it by these powers then I will spell it out for you. Blackbolt is ridiculously powerful, he is a walking, flying, psychic Deathstar. When you start look for a character who has a Superman like powerlevel in the Marvel Universe then Blackbolt immediately comes to mind. Medusa speaks for Blackbolt. Blackbolt telepathically communicates with her and she speaks for the King. This makes Medusa extremely important because otherwise the Inhumans would be lost on what Blackbolt wants. There is reason to believe that the Inhumans will have a big role in Marvel's Phase 3 roll out. The Inhumans film has been canceled but it has been replaced with TV Series that will have its first 2 episodes air in Imax theaters. This will be the first time a merger between Imax and a tv series has been done. Actor Anson Mount known for his role on Hell on Wheels and Crossroads has been cast as Black Bolt. Anson also had a role in the show Conviction and appeared in an episode of Lost. Truth be told I have not seen Hell On Wheels but I have been told by friends that he is a great actor is great in that show. One comment from a friend really stood out to me. She said he acts a lot with his eyes. Alright anybody who knows anything about Blackbolt realizes that Blackbolt will not be able to talk so acting with his body and eyes is going to be very important. This may be a reason why he was cast. I think he does have a great look in particular I think he does have great eyes that can portray the solemnity of Blackbolt. Really really intriguing casting I'm excited to see what he does. 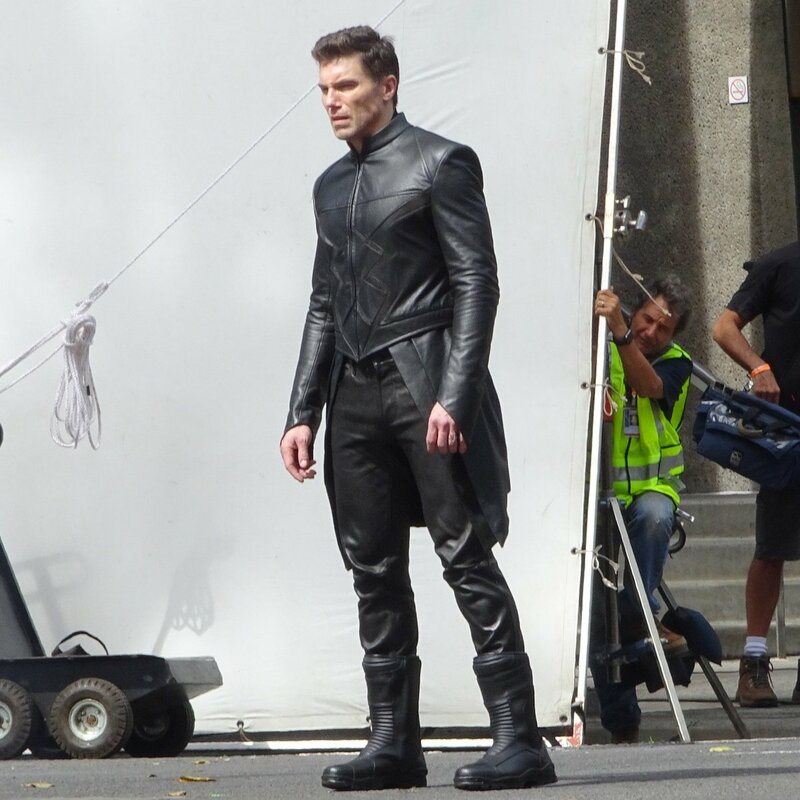 There were photos snapped of Anson Mount as Black Bolt in a scene that seems to appear on Earth. He is not wearing the Blackbolt mask in this picture. Update: The Inhumans show opened as a critical failure and failed to garner attention to keep it around. It was canceled after its first season. Here is a fun video I found of Anson showing how to make an Old Fashioned cocktail. Personally, I give mad automatic props to anyone who can make a cocktail like that. Prior Speculations Initial speculation was that Vin Diesel was set to play Blackbolt in the Inhumans film. Vin Diesel said he had met with Marvel for a role down in the future. He agreed to do the extra role of Groot but little has been said of what the future role could have been. Many think this speculated role was for Blackbolt. Vin Diesel even mentioned that one role he was lending his voice to, and the other only his body. As Blackbolt does not talk this seems to be a large hint at him playing the role. However, this was prior to Inhumans being turned into a part film part TV series so it is hard to know if Vin Diesel would still be attached at the helm of the project.